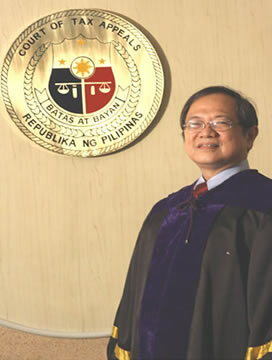 Associate Justice Juanito C. Castañeda, Jr. Associate Justice Juanito C. Castañeda, Jr. is Chairperson of the Second Division of the Court of Tax Appeals. He was originally appointed as Associate Judge of the Court on October 1, 2001. He took his Oath as Associate Justice on April 26, 2004. His Honor finished his elementary (GS '65), high school (HS "69 Honors Class) and undergraduate studies (A.B. Economics '73) at the Ateneo de Manila, Loyola Heights, Quezon City. He obtained his Bachelor of Laws degree in 1977 from the University of the Philippines, Diliman, Quezon City, where he ranked 9th in his class. He passed the 1977 Philippine Bar Exams with a rating of 85.5875% and was admitted to the Philippine Bar on April 19, 1978. His first employment was with the law firm of Romero, Lagman, Pasamba & Associates as an Associate for the period from January 1, 1978 to August 31, 1978. He then worked for SGV, the country's largest professional firm, from September 1, 1978 to April 30, 1983, first as Senior Associate, then as Supervisor and finally as Manager of its Tax Division. From May 1, 1983 to September 30, 1995, he worked with the multinational firm, Jardine Davies, Inc., as Tax Manager, Head of Tax Department and Assistant Vice-President, Legal Tax and Corporate Division. Immediately prior to joining the judiciary, he worked as partner of the law firm, Baga and Associates, from October 1, 1995 to September 30, 2001. Justice Castañeda composed the lyrics of the CTA Hymn. He was a student editor of the Philippine Law Journal at the University of the Philippines College of Law. He also won first prize in the First Albino Z. Sycip-Portia Legal Essay Competition. He chairs the CTA Committees on Records Management & Information Technology, the PSB for high ranking positions, the Personnel Development Committee and the Committee on Legal and Technical Services. Justice Castañeda is married to Catherine Quimpo Castañeda, who is employed with the Commission on Higher Education (CHED) as Director IV. The couple has one child, Juanito III, who is married with one child.